Trans American Technical Institute, Incorporated has been training tractor trailer drivers since 1988 at their Fleetville (Route 107 at exit 202 off I-81) facility, The tractor trailer driver curriculums are designed to include topical, relevant material and subject matter to the successful completion of a meaningful, quality program. It should be noted that the latest Commercial Driver License (CDL) material is included in the curriculum using the Professional Truck Driver Handbook, VCR tapes and the CDL manual that the Pennsylvania Department of Transportation has provided for training purposes. Trans American Technical Institute is certified as a Third Party Tester by the Pennsylvania Department of Transportation. The course concentrates on "hands on" training and the students are given special attention if they need extra help. 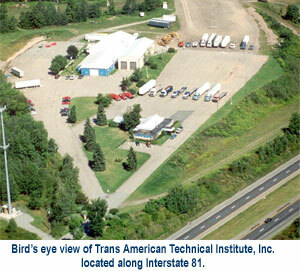 Trans American will furnish the necessary equipment (driving simulators, 5, 7, 8, 9, and 10 speed tractors, flatbed, dump, lowboy and van trailers of varying lengths) materials, facilities, and other services at the 75 acre site that has 3 office / classroom / maintenance buildings located in Lackawanna County. Upon graduation the students will be awarded a diploma and can be placed in full time tractor trailer driving positions with national or local freight carriers (Recruiters from major carriers visit the school on a regular basis). They will also attain a Pennsylvania Class A Commercial Drivers License with appropriate endorsements as required.